Well, I wasn’t supposed to be home today. I was actually on my way to Canada this morning when I got a phone call telling me to go home. The company I was to work for didn’t get all the right paperwork, so they couldn’t use me. On the plus side, I still get paid about 75% of what I was supposed to make because they cancelled me the day of the job. Since I wasn’t planning on being home, we didn’t have any food in the house for lunch. J got home from work a little earlier than usual and I was already up, so we headed out for lunch again. I wanted to go somewhere downtown and I wanted a burger. We’ve drove around downtown Kalamazoo several times, but never really walked around. 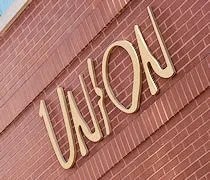 I ended up finding the Union Cabaret & Grill online and was happy with what was offered, so that’s where we went. The restaurant is on the bottom floor of the Kalamazoo City Center on Kalamazoo Mall Drive just south of Michigan Avenue. Today’s visit was the first time I had been to the Union, but it was actually J’s second. Before she was transferred to Kalamazoo, she came over here once a week last summer to fill in. After work one night, a group of co-workers invited her out for drinks and they went to the Union. The space is fantastic. There’s a hostess station right as you walk in the door. Beyond that is a huge bar that separates two dining areas. Right in the middle is a large stage with lounge chairs surrounding it. The Union has a partnership with Western Michigan University and features students and alumni performers. The Millenium Restaurant Group bills the restaurant as a Chicago-Style Jazz bar. Jazz isn’t my thing and even though I’m from Chicago, I have never been to a jazz bar, so I’m not really sure what that means. The hostess took us to a pub table in the dining room area closest to the exterior windows. We were actually in at lunch time and there were several business lunches going on around us. The first interesting thing we noticed was the drink specials. Instead of a generic plastic holder, they actually used old DVD cases and slipped in paper to the cover slots. The lunch menu is pretty sandwich heavy with options for soup, salad, and even a “working man’s lunch.” I wanted a burger. That’s all I really cared about. 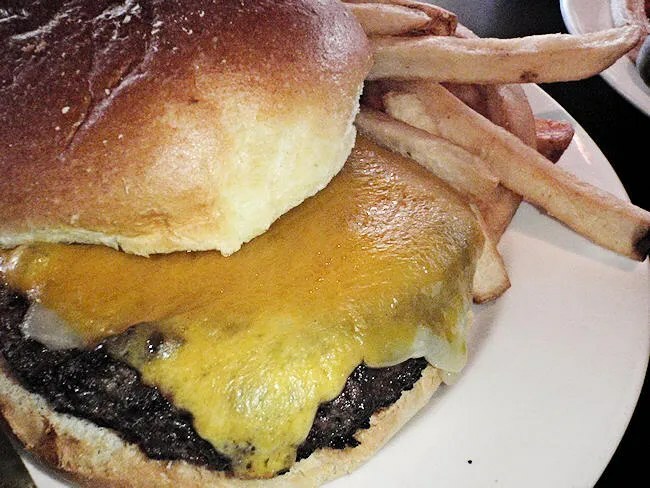 The burger option is the Union Double Cheddar Burger. It’s a simple sandwich. The meat is char-broiled then topped with two slices of cheddar cheese. It’s served on a brioche style roll with lettuce, tomato, and onion. The waitress asked if I wanted mustard or mayo when she brought it out which wasn’t necessary. The burger had a really good flame kissed taste to it. I was a little thrown by the “double” part on the menu. I assumed it was two beef patties, but it was actually two slices of cheddar. I should learn to read. It was spelled out for me, but I missed. The burger was good and satisfied the craving. The brioche style roll was delicious. Good choice for the sandwich. I got fries as my side. They were skin on, but they did sort of taste like they had been sitting around for a while. They weren’t cold, but they weren’t fresh out of the fryer either. I almost liked my plate clean. I was that hungry and the food was pretty darn good. J went with the Blackened Chicken Sandwich and this is where the Union hit a home run. The chicken had a liberal dusting of Cajun blackening spices on one side. 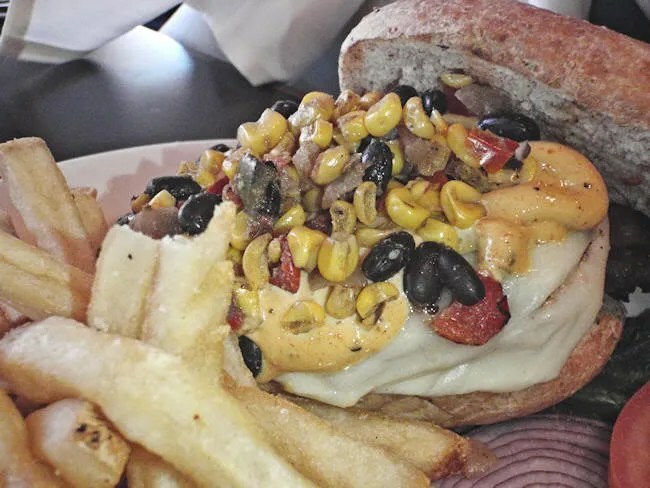 It was topped with provolone, a roasted corn salsa, and a Cajun dressing then served on a cracked wheat roll. J loved this sandwich. The chicken was fairly thick which is normally a problem for her, but she said it was so tender and juicy it didn’t really bother her. She was a big fan of the salsa and the Cajun dressing which gave the sandwich quite a kick. She also got fries with her sandwich although she didn’t say if they were warm or not. Our bill was just a little over $21. We were both happy with our meals although if I had to pick who got the better sandwich, it was definitely J. 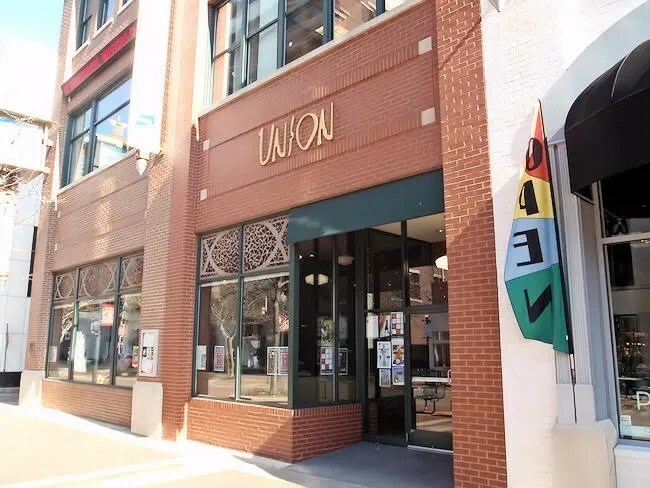 The Union Cabaret & Grill is really a great place in downtown Kalamazoo. If jazz music is your thing, I could see this as the go-to place in town. They have great food, good drink specials, and a really interesting, yet inviting atmosphere. I wonder if the burger menu has changed a bit? Go there often for $5 burger Tuesdays and they have a good half dozen to choose from now.